Each has distinct applications and component needs. While most people are captivated by the high-tech nature of solar-electric (photovoltaic; PV) systems, in most cases, a solar hot water system will harvest more energy at a substantially lower cost. In fact, compared to PVs, solar hot water (SHW) collectors are more than three times as efficient at producing energy from the sun. Investing in an SHW system is a smart solar solution for most homeowners. This proven and reliable technology offers long-term performance with low maintenance. And with federal, state, and utility incentives available, these systems offer a quick payback—in some cases, only four to eight years. A thoughtfully designed SHW system could provide all, or at least a significant amount, of your household hot water needs for some portion of the year. The California Energy Commission estimates that installing an SHW system in a typical household using electric water heating can shave 60 to 70 percent off water heating costs. To get the most for your money, you´ll want a properly sized system that offers the best performance in your climate. The proven winners are simple, reliable, and long lasting. Some systems are "open loop" (the domestic water itself is directly heated) and some are "closed loop" (a heat-transfer fluid is heated by the collector and the heat is passed on to the domestic hot water by means of a heat exchanger). Some systems are "active," using moving parts such as pumps and valves, and others are "passive," using no mechanical or moving parts. There are many considerations in choosing the best system for a home, but the client and the situation will dictate the right system. For instance, for a one- to two-person household in a temperate climate where hard freezes rarely occur, you might go with a batch heater, especially if the hot water will be used more at the end of the day rather than first thing in the morning. In a household with three or more people, where aesthetics and weight are not an issue, the thermosyphon system might fit the bill, especially if there´s no room for an additional tank near the existing water heater. The drainback system, a personal favorite here in the Northwest, requires continuous drop between the solar collector and the solar storage tank. If continuous fall is not possible, there´s always the pressurized glycol system where piping can go up, down, over, and around without concern. Usually more than one option can work for any situation. The number of people in the household will dictate how large the system will need to be, and which systems are even possible. Rebate and incentive programs may only qualify certain systems in a given area. Some systems are relatively easy to install for do-it-yourselfers, while others most laypeople shouldn´t attempt. See the comparative chart showing features of the different system types. Make your choice, and enjoy using solar energy to heat your water! 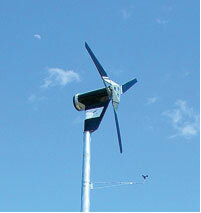 Small wind-electric systems can provide electricity on remote, off-grid sites, or right in town connected to the utility grid. Although wind systems require more maintenance and need more attention than solar-electric or microhydro-electric systems, if you invest up front in good equipment, design, and installation, wind-electric systems can make economic and environmental sense. They also bring a great deal of satisfaction—there´s nothing quite like watching your wind generator convert a summer breeze or a winter storm into electrical energy. Boiled down to its simplest principles, a wind generator´s rotating blades convert the wind´s kinetic energy into rotational momentum in a shaft. The rotating shaft turns an alternator, which makes electricity. This electricity is transmitted through wiring down the tower to its end use. The blades use engineered airfoils, matched to the alternator, that capture the wind´s energy. Most modern wind generators use three blades, the best compromise between the highest efficiency possible (one blade) and the balance that comes with multiple blades. Together, the blades and the hub they are attached to are termed the rotor , which is the collector of the system, intercepting winds that pass by. Most turbines on the market today are upwind machines—their blades are on the windward side of the tower. A few downwind machines are available, but neither configuration has a clear performance advantage over the other. In most small-scale designs, the rotor is connected directly to the shaft of a permanent magnet alternator, which creates wild, three-phase AC. Wild, three-phase electricity means that the voltage and frequency vary continuously with the wind speed. They are not fixed like the 60 Hz, 120 VAC electricity coming out of common household outlets. The wild output is rectified to DC to either charge batteries or feed a grid-synchronous inverter. In most designs (up to 15 KW in peak capacity), the rotor is usually connected directly to the alternator, which eliminates the additional maintenance of gears. In systems 20 KW and larger, as well as some smaller wind systems (like the Endurance, Tulipo, or Aircon), a gearbox is used to increase alternator speed from a slower turning rotor. The blades must turn to face the wind, so a yaw bearing is needed, allowing the wind turbine to track the winds as they shift direction. The tail directs the rotor into the wind. 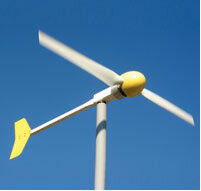 Some sort of governing system limits the rotor rpm as well as generator output to protect the turbine from high winds. A shutdown mechanism is also useful to stop the machine when necessary, such as during an extreme storm, when you do not need the energy, or when you want to service the system. Wind turbine rating is a tricky affair. While solar-electric module or micro hydro-electric turbine production can be predicted fairly realistically based on rated output, this number is very misleading with wind turbines. Why? Because rated output is pegged to a particular wind speed, and different manufacturers use different wind speeds to determine rated output. Also, the power available in the wind varies with the cube of its speed, so small increases in wind speed result in large increases in power available to the rotor. A 10 percent increase in wind speed yields a 33 percent increase in power available in the wind. Conversely, this means that a turbine rated at 1,000 watts at 28 mph might produce only 125 watts or less at half that wind speed, 14 mph. So what’s a wind turbine buyer to do? Ignore the peak output and the power curve. Look for the monthly or annual energy numbers for the turbine, estimated for the average wind speed you expect or measure at your site. These will be given in KWH per month (or year) in the manufacturer’s specifications for each turbine. Energy is what you’re after, not peak power! If, for example, you are looking for a turbine that can produce 300 KWH per month, and you know that you have a 10 mph average wind speed at the proposed turbine height, you can shop for a turbine that is predicted to generate that much energy in that average wind speed. If you can’t get energy production estimates from the manufacturer or a turbine owner, look for a different manufacturer. This is basic information that any manufacturer should supply. However, knowing a turbine’s swept area may also help you calculate the annual energy output for the wind turbine. All other things being equal, ?there’s no replacement for displacement.? Jim Green at the National Renewable Energy Lab (NREL) developed a similar formula: annual energy output (AEO) in KWH = 0.01328 x rotor diameter (ft.) squared x average wind speed (mph) cubed. A turbine’s revolutions per minute (rpm) at its rated wind speed can give you some idea of the relative aerodynamic sound of the machine, and also speaks to longevity. Slower-turning wind turbines tend to be quieter and last longer. High rpm machines wear out components, such as bearings, much faster. In addition, the faster blades move through the air, the greater the possibility that they will waste some of that energy as sound from the blades. 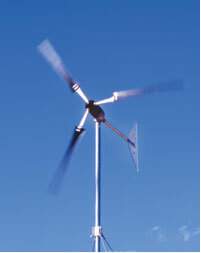 Trying to keep an inexpensive wind generator running can be an uphill battle that you´ll soon tire of. But expect to pay more for a better machine—it´s a tough job to design and manufacture a long-lasting, small-scale wind generator. The bottom line: Buy a turbine that has a very good track record and a good warranty—five years is preferable but not always available in the small wind industry. A warranty is one indication of the manufacturer´s confidence in their product, and their intention to stand behind it. Real-world reports from users carry even more weight than a warranty, so search for people who own the model of turbine you´re considering buying, and get the straight scoop from them about performance, durability, reliability, and maintenance issues. Note that a number of the wind turbines listed here are relatively new introductions with not very much customer run-time in North America. These turbines include the ARE, Eoltec, Kestrel, and Skystream. We recommend that you contact either your local wind turbine installer, or the manufacturers or importers and find out how many of these machines are actually operating in North America. Then contact the owners, and inquire about their experience and satisfaction with both the machine and the manufacturer or importer. Some manufacturers make only battery-charging machines, and may offer a variety of turbine voltages. Others produce machines intended to connect to grid-synchronous inverters without batteries. One machine even includes an inverter integrated with the turbine itself. Make sure you´re buying a machine that is appropriate for your intended use. When you look at prices, keep in mind that just buying a wind turbine will not get you any wind-generated electricity. You´ll also need most or all of the components mentioned elsewhere. Also budget for equipment rental, like a backhoe and crane, concrete and rebar, electrical components, shipping, and sales tax. Unless you do all of the work yourself, also factor in installation labor expenses. These costs can add up significantly, so make sure that you research and understand all of the associated expenses before committing to a purchase. Many people are quite surprised to learn that the wind turbine cost can range from only 10 percent to as much as 40 percent of the entire wind system´s expenses. Small-scale wind energy is not for the half-hearted, uninvolved, or uncommitted, and probably not for folks who never change the oil in their vehicles (or are willing to spend the bucks to hire someone to do the tower work). The North American landscape is littered with failed installations: Designs not fully thought-out or tested, machines bought because they were cheap, and installations that required more time and money for repairs than they ever yielded in electricity generated. Many of the failures were the result of wishful thinking and too little research. That said, there are tens of thousands of happy wind-electric system owners. These owners did their homework—purchasing, designing, and installing rugged and well-thought-out systems on adequately sized towers. In addition, they are either committed to maintaining the systems, or to hiring someone to do this regular work. While many first-time wind turbine buyers may be looking for a bargain, second-time wind turbine buyers are seeking the most rugged machine they can afford. You can avoid a painful "learning experience? by focusing on durability, production, warranty, and track record, and not on price alone, or on peak output. You don´t want to depend on the low bidder for something as important to you as your long-term energy investment.